If you need new clients, read on. What I’m going to share with you is how I helped a client get 3 new clients literally overnight with 1 blog post that ranked for 50 different search terms on page 1 of Google. One is worth $70,000. In the screen image below you will see the blog post shows 17 hours since it was posted. I should have taken a screen image right after it was published to show you that the blog post actually ranked for a few Google search terms within 7 minutes of going live. My target keyword is decorative concrete flooring Bethesda Maryland as you can see below. What is really exciting is that since the post went live, the results keep getting better. First let me tell you a little about my client. Dan is a decorative concrete pro contractor. He specializes in concrete floor coatings like the pictures here. The floor coatings industry has been a huge growth industry thanks to the internet. Before the internet, the industry didn’t have visibility to a mass market. Only a few local contractors around the country worked in this field. Concrete coatings is an exciting market. They provide a unique function and design solution for many property types. For example, Epoxies are a high performance coating, like super powered paint, that can be applied on garage floors. This makes garages clean and decorative. Concrete can be stained with various colors and sealed producing a decorative appearance. There are thin overlays about 1/16th inch thick that can be applied over old concrete, then stained or cut with tools producing tile finish. There are many different products being created by companies like SureCrete that solve many issues. The same types of products being applied to garage floors also are applied on floors at Stadiums, restaurants, showrooms, retail stores, hospitals and just about any floor you can think of. They’re also being applied to interior and exterior walls of homes and commercial buildings. Dan got into this business 12 years ago starting with a client who was a real estate investor who needed a solution for a floor in an industrial building. A few years ago, Dan and I worked on generating new customers for his business from various online sources. The results were tremendous. As the leads came in, Dan started asking “how can I expand and scale my business”. Dan’s business is expanding thanks to the internet. As more leads came in than Dan could handle, he started building a network of contractors who could complete the projects. This is how a small, specialty contractor has taken a local business to cover a regional market from Boston To Maryland (nationwide coming soon). He provides the leads and works directly with the contractors to close the sale. Effectively, he has become a sort of in house marketing department for contractors throughout the east coast. Dan speaks to every prospect to determine their requirement. Then he matches the right contractor for each project. He follows through with each contractor and client every step of the way. Since many projects take months before the client is ready to move forward, Dan follows up constantly. This is great for the client while freeing the contractor to work on projects. It’s a win/win solution. In fact, it’s starting to lead to multiple regional and national projects. So How About That Magical Blog Post? Now that you have a little background, let’s talk about that blog post. Dan calls me and asks “ how do I get more concrete floors in Bethesda MD?”. He tells me Bethesda Maryland has wealthy residents, lots of commercial properties and is right next to Washington DC. There are 60,000 residents, so a good sized town. So, I proceed to write a blog post. My goal is to create a landing page that looks like a one page website on a lead generation website that drives customers to his website. I use photos of different types of properties to showcase to a page visitor the scope of services. The target keywords are concrete floors and Bethesda Maryland. But throughout the blog post I use relevant words and synonyms. My goal is to create as many Google results from 1 page as possible. Almost instantly (within 7 minutes) , the page ranks on the first page of Google. The next morning Dan and I start searching for different ways. We found about 50 first page results in less than 12 hours. As of this writing, Dan got 3 new leads. One is about $70,000 including a floor stain, epoxy and concrete countertop for a restaurant renovation. Now, we’re creating a video to promote the page and drive traffic from YouTube, We’re creating pages on various Web 2.0 properties. We’ll submit the blog to various sources who will promote the page. 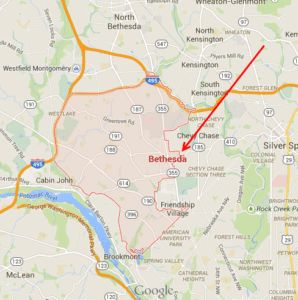 If we need more results, we’ll create a few Facebook ads targeting the Bethesda area. Pretty exciting. This is how to build a profitable business. It all started in a local market. By the way. I just spoke to Dan, He’s swamped with more leads than he can handle. I know Dan, he won’t let any slip through. And by the way, if you have questions and comments post them below.